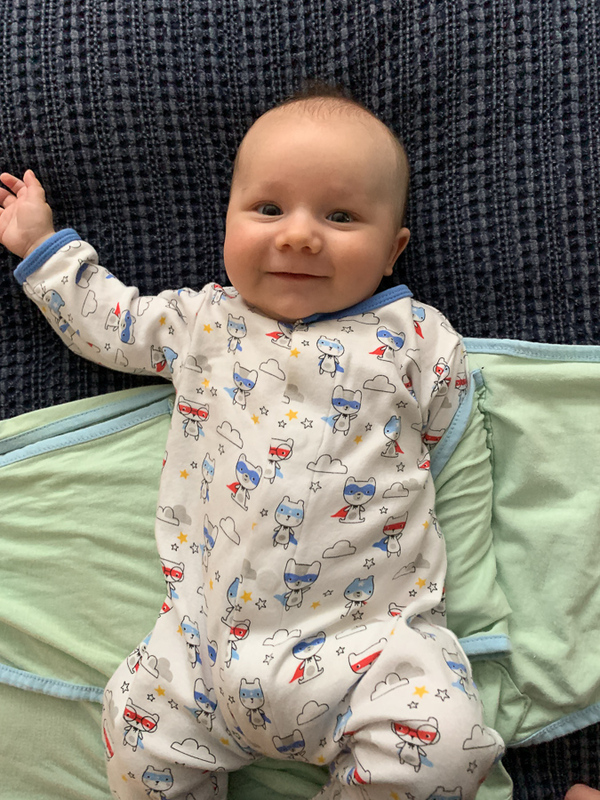 If you’ve noticed, I’ve been loosely following a blog schedule of weekend recaps on Mon/Tues, two topical posts during the week, one personal/update kind of post during the week, and on Fridays I like to do what I call “spoonful of life” posts. Just a mish-mosh of photos from my life to share: meals, baby, tidbits and tips. So here is today’s spoonful of life! Birch and I are continuing the Friday trend of mommy & me yoga followed by lunch at Tilman’s. Here he is having a staring contest with his squirrel! He has been so happy in yoga so far (I think we’ve gone to 4 classes). Barely a peep from him! 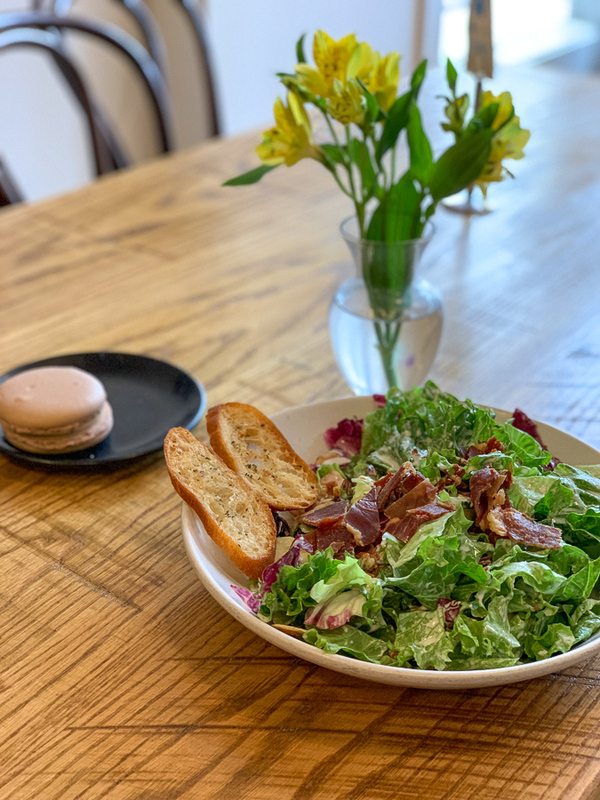 Obviously lunch afterwards is my favorite part : ) The gorgonzola dressing on this salad was epic! 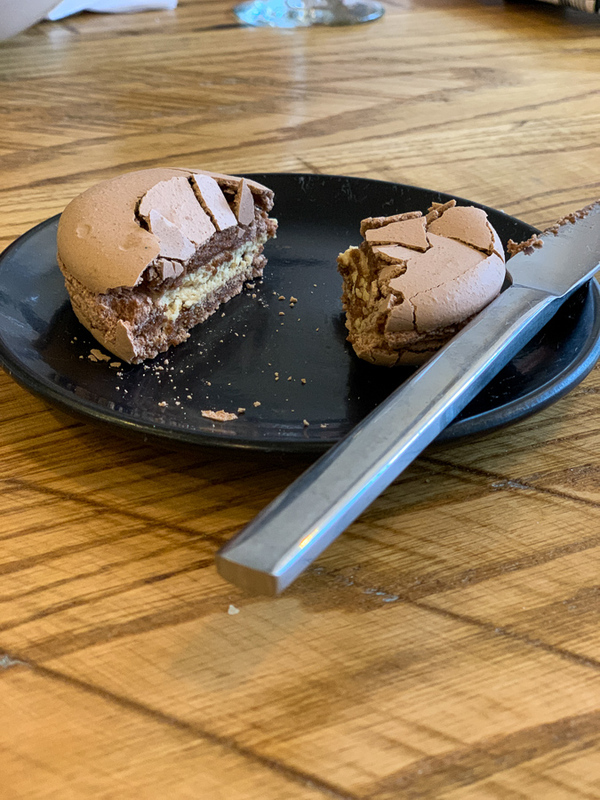 And that is a bourbon brown butter giant macaron that I shared with a friend. Probably the best one I’ve ever had! 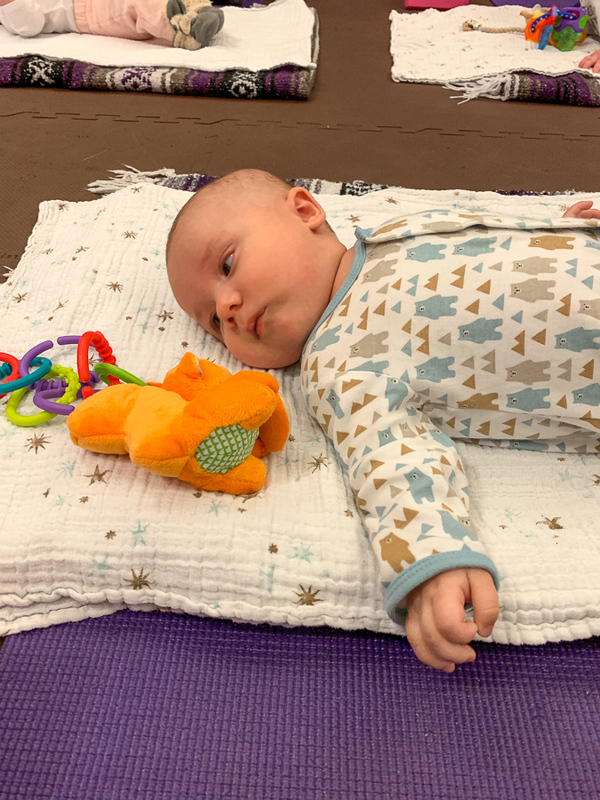 My babysitter comes on Mondays and Wednesdays, and if I am able to get enough work done during naps, I “allow” myself to go to my favorite strength class, which feels like such a treat! I picked up the heaviest weights I could on Monday and my gosh I was sore on Tuesday! B and I went on lots of walks this week because our weather was so mild. I cannot wait for permanent spring! 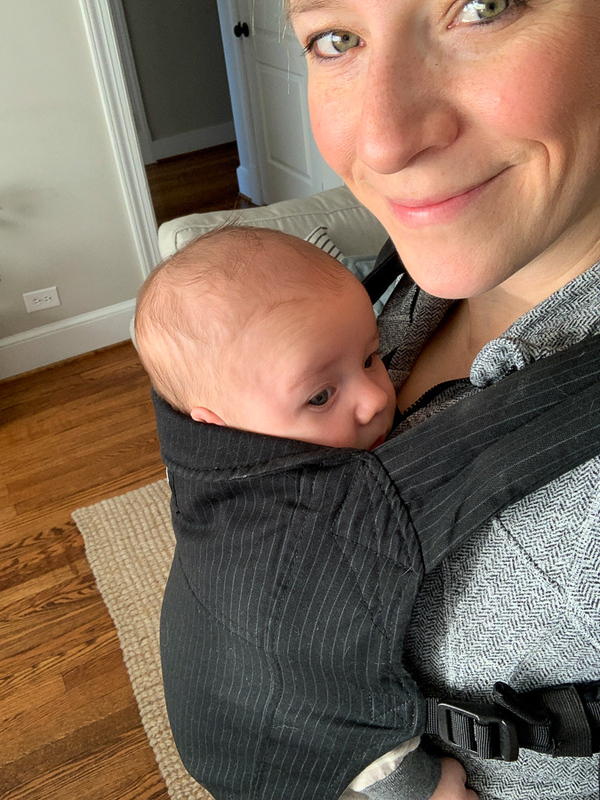 I’m wearing him in the Boba carrier a lot now, and I think we’re done with wraps. The carriers have so much better back support to me, and are quicker to put on (although not as easy to fit in the diaper bag.) I’m not sure they make the one I have anymore, but I love the looks of the Air, which is the same style but breathable and lightweight. 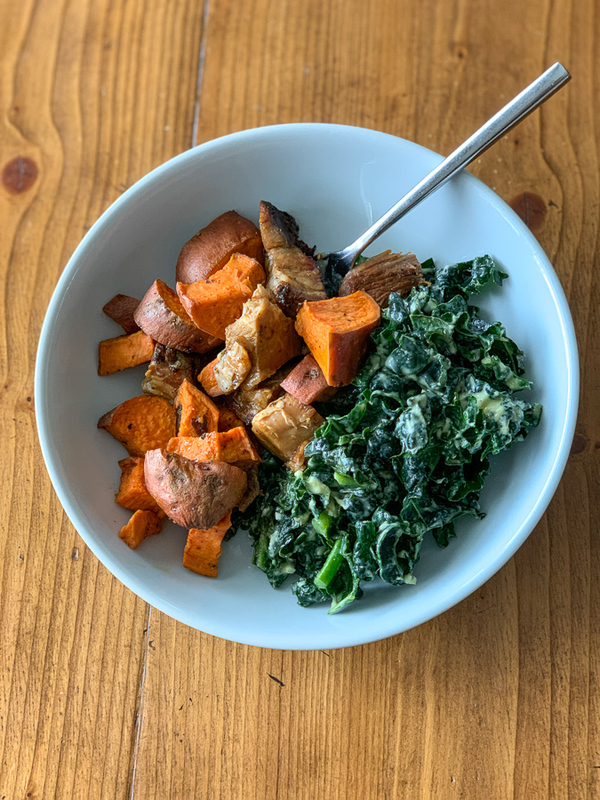 A yummy lunch – kale salad with avocado dressing, leftover pork and sweet potatoes I roasted on the weekend. Speaking of yummy, I watched the first episode of the show Yummy Mummies on Netflix. I can’t decide if I want to watch more. I also started The Bachelor and will probably continue. I hate that I can’t stop watching it. Birchie is done with swaddling and on to the Merlin sleep suit. I hope to use it for a few weeks and then transition to a regular sleep sack. He’s doing great in the Merlin and did back-to-back nine hour nights earlier this week! 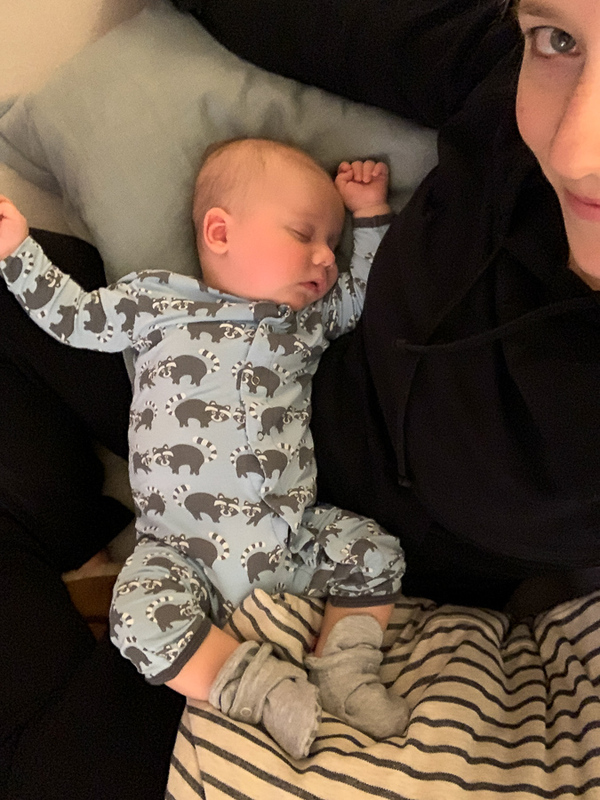 It seems like the days of him falling asleep while nursing in my lap are fewer and fewer. That makes me want to shed a little tear! He’s growing up too fast. I captured his silly little face he makes when he’s concentrating. The little pursed lips! Mazen used to do the same thing. I bought some Noxzema randomly and am loving the smell and tingle. Takes me right back to my childhood. My mom is a Nox fanatic, and my grandparents were too. My great uncle took the recipe to Canada, apparently, so it’s a family loyalty. Mazey brought this book home from his school library, and it’s so sweet! I won’t spoil the plot, but I just love the story line. Look for it at your library! 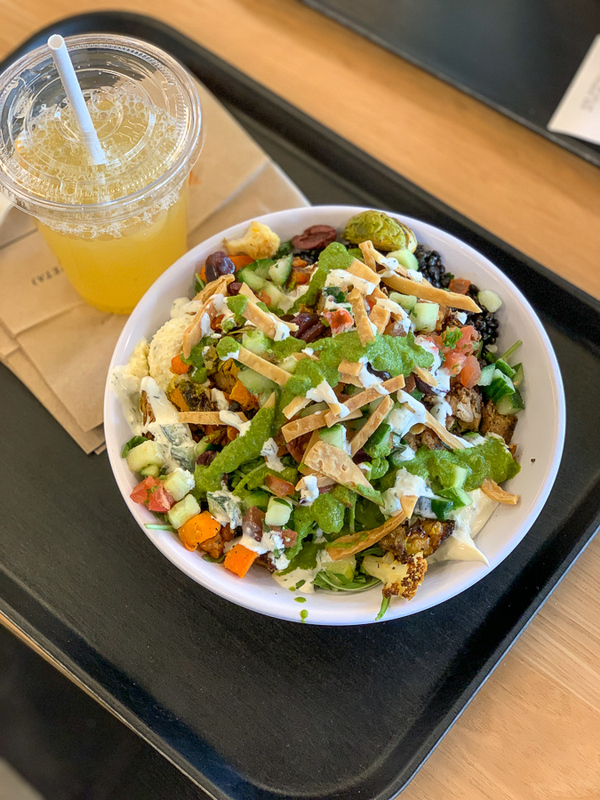 I had lunch with a friend at Cava recently and ate every bite of this bowl! Big salad bowls with a large variety of toppings are my all-time favorite lunches. 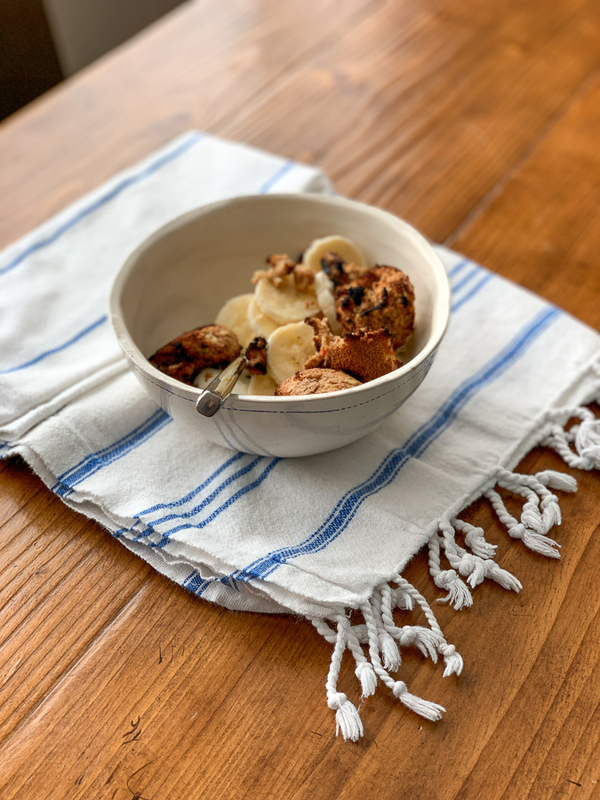 And finally – I love oatmeal for a snack on super cold days. 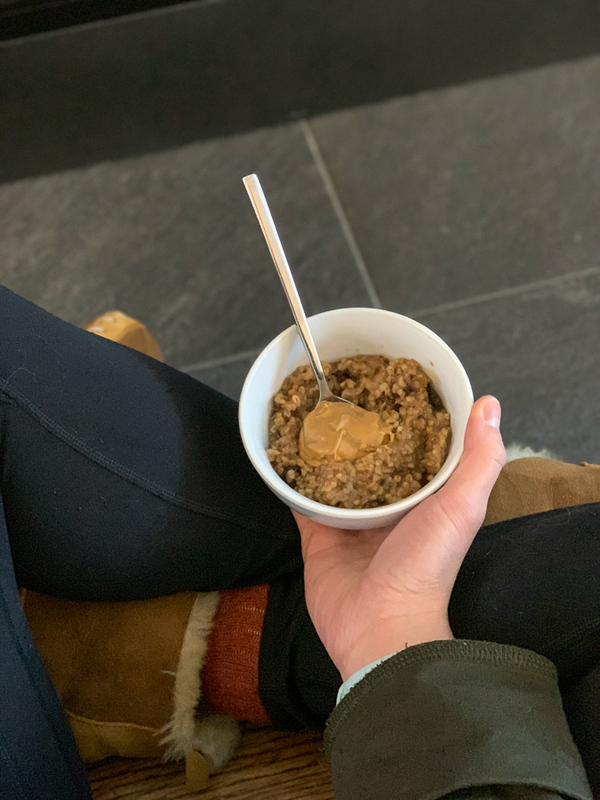 While this week was warmer than most, I enjoyed this cinnamony oatmeal snack with peanut butter on a super cold day last week by the fire. Warming to the core! I just started buying Noxzema again – I used it all through middle and high school and kind of forgot about it til recently. It’s the best! Thomas is loving it too now! Do you mind sharing which bouncy chair Birch is using in the above picture. What a cutie! Thanks. It’s this one. Super cheap! I had forgot all about noxzema! Now I must find some too. I love the tingle and how clean my face feels after! Cute pictures of baby as usual!! Love this spoonful of life post Kath! It’s a perfect way to end the week! I hear you on the wraps vs structured baby carriers after they reach a certain age. 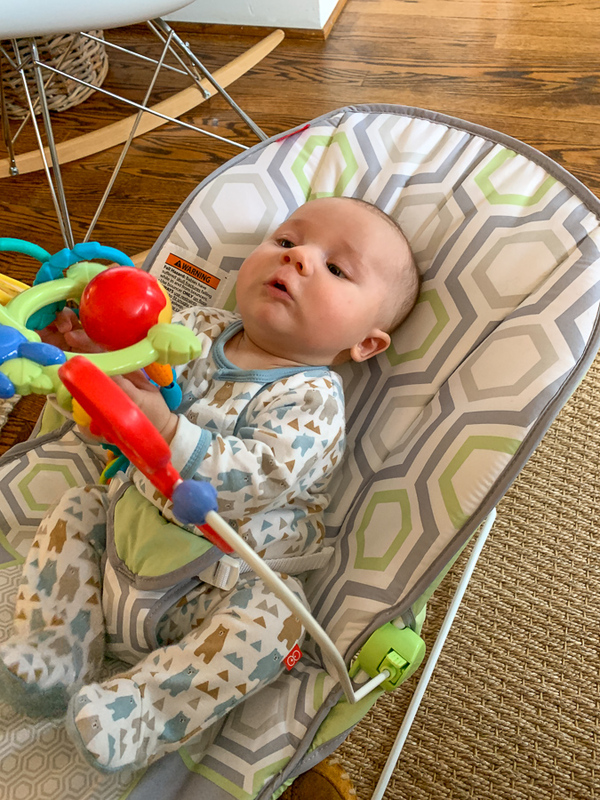 I’ve been exclusively using the Ergo baby with my 7 month old for awhile now because of the back support and they just get heavier haha…bonus, it’s awesome for air traveling and we didn’t even miss the stroller on a quick long weekend trip. I used Noxzema throughout high school and college and you’ve inspired me to go grab a tub. My mom swore by it too! Birch is so adorable and the concentration face is the best :). 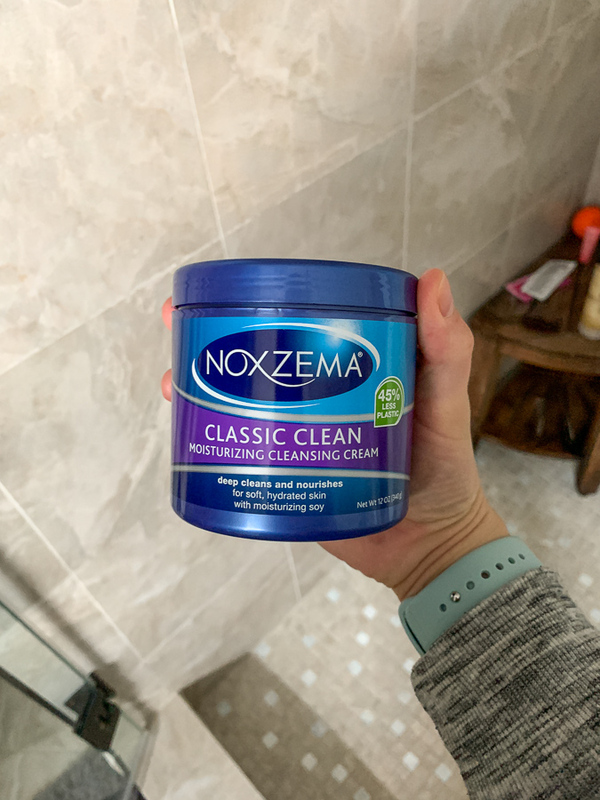 I just recently rediscovered Noxzema too and am loving it! I love to put it on as a mask and leave it until it dries up then wash it off. If I’m getting a little pimple, I dab some on at bedtime and leave it overnight and it’s almost always gone in the morning. Love it! I’ve never used it like that but I’m intrigued! Loving the posts, but the ads seem like they’re out of control! Is there any way they can get paired down at all? I just find them distracting, but know that they contribute to you doing the blog, so completely understand the necessity! I love noxzema too! What does “my great uncle took the recipe to Canada mean”? He made his own? He bought the recipe and then created his own company there. I just finished watching all of Yummy Mummies. I liked the end of the season (when everyone was having their babies!) much better than the beginning when the focus seemed to be much more materialistic. I thought it was fun, fluffy TV and enjoyed the friendship between Rachel, Lorinska, and Jane but Maria kind of drove me crazy. Interested to hear what you think if you keep watching! I do want to see the births!! WHat is your recipe for the oatmeal snack?! I am having all the breastfeeding hunger that I can’t keep satisfied after protein rich meals! My daughter is 9.5 weeks! It’s an Instant Pot recipe you’ll see soon! I reheated up the leftovers. 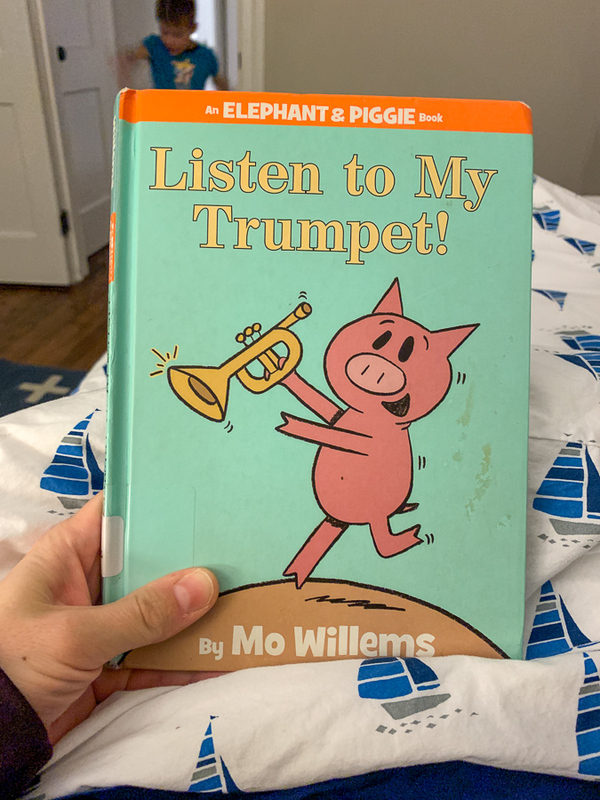 We love the Elephant and Piggie books in our house! There are many in the series and they are all really cute. Glad Mazen enjoys them!